Russian rabbi and Zionist; born in Hluboka, government of Wilna, April 25, 1824; died in Byelostok June 10, 1898. His father, Judah Löb, educated him not only in Hebrew, but also in secular subjects, and Mohilewer became in consequence an advocate of the introduction of European culture among his people. Ordained in his eighteenth year, he occupied the rabbinates successively of his native town (1848-56), Szaki (1856-60), Suwalki (1860-68), Radom (1868-83), and Byelostok (1883-98). With a keen eye for the practical needs of his people, Mohilewer devoted his energies and his fortune to Zionism. In 1875, on the occasion of the celebration of the ninetieth birthday of Sir Moses Montefiore, Mohilewer openly declared himself in favor of the colonization of Palestine. After the great persecution of the Jews in 1881 he accompanied the Russian refugees as far as Lemberg and suggested to the Emigration Committee that they be sent to the Holy Land. On his returnin 1882 he founded the first Chovevei Zion Society in Warsaw. In the same year, and again in 1886, he undertook journeys to western Europe to win adherents for the movement. In Paris, with the help of Zadoc Kahn and M. Erlanger, he succeeded in gaining the support of Baron Edmond de Roths-child, who commissioned him to select a number of Russian Jewish families as colonists. Their colony, Ekron, prospered at first, but when the colonists in 1888 were influenced by agitators to stop work, that year being a Shemiṭṭah year, economic failure became imminent. At this juncture Mohilewer and other prominent Russian rabbis stepped in, and reassured the colonists of the religious propriety of resuming work. On another occasion, in 1889, when quarrels arose between the administration and the population of the colony Rishon leẒiyyon, Mohilewer acted as arbitrator. 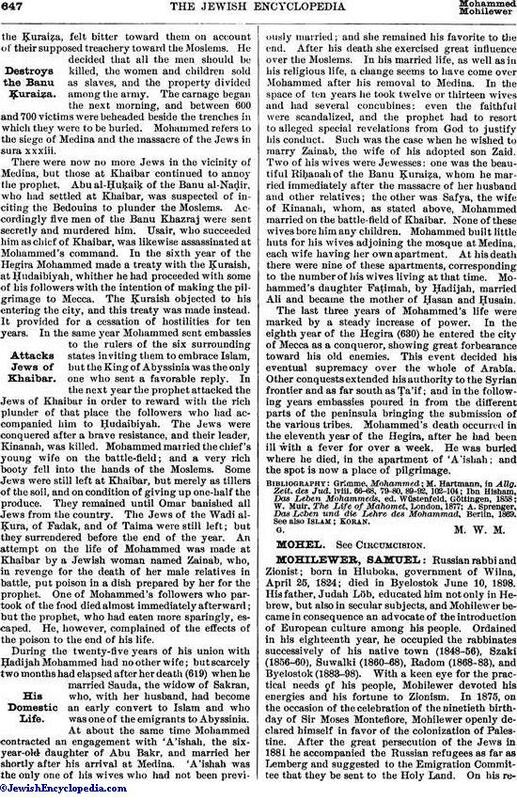 In 1896 he again favored the non-observance of the Shemiṭṭah year. In 1890 he went to Palestine himself to inspect the colonies, and from this journey gained "new hope for a brighter future for Israel as soon as Israel shall take the right path and every Jew shall consider the honor of the nation rather than his own personal advantage." During his stay in Palestine Mohilewer, backed by certain wealthy Russian Zionists, bought 1,556 acres of land near Jaffa and founded the colony Rehoboth (see Jew. Encyc. i. 250, s.v. Agricultural Colonies in Palestine). In 1891, hearing of the intention of Baron de Hirsch to found colonies, he again went to Paris and urged, though unsuccessfully, the choice of Palestine instead of the Argentine Republic as the land of Jewish colonization. In the Zionist movement as outlined at the first Basel Congress in 1897 Mohilewer took a prominent part as leader of the Russian Zionists. His influence and activity in the propagation of this movement were remarkable. As the condition of his health had prevented him from attending the first Basel Congress, he had sent a letter of greeting in Hebrew, full of wise and practical advice. The day before his death Mohilewer wrote a circular letter to all friends of Zion, recommending the foundation of the Jewish Colonial Bank and the colonization of Palestine, and at the same time urging again the idea of unity. This last letter may be regarded as containing his testament to his people. Among his posthumous works are a collection of responsa, commentaries on Ḥoshen Mishpaṭ, and sermons. His Hebrew treatise entitled "Massa Polen," concerning the condition of the Jews in Poland, appeared in a German journal in 1872. 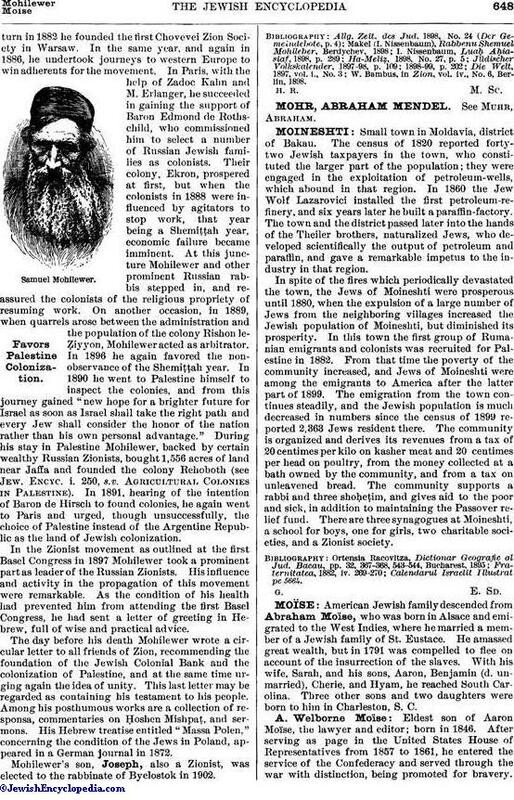 Mohilewer's son, Joseph, also a Zionist, was elected to the rabbinate of Byelostok in 1902. W. Bambus, in Zion, vol. iv., No. 6, Berlin, 1898.